By Samali Bikangaga. 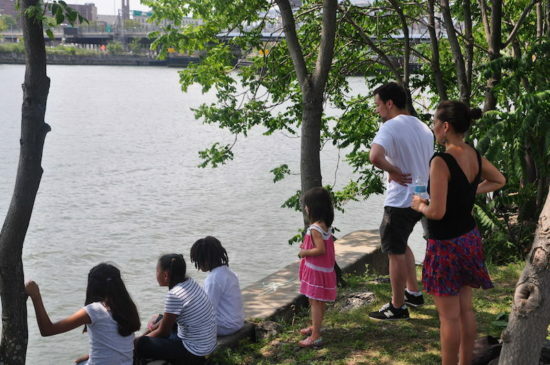 Residents celebrate City of Water Day on the banks of the Harlem River in Port Morris waterfront on July 16. The area below the Third Avenue Bridge has seen better days. Traffic zooms by above the broken asphalt and an adjacent patch of grass. A chain link fence cuts Port Morris off from the Harlem River. 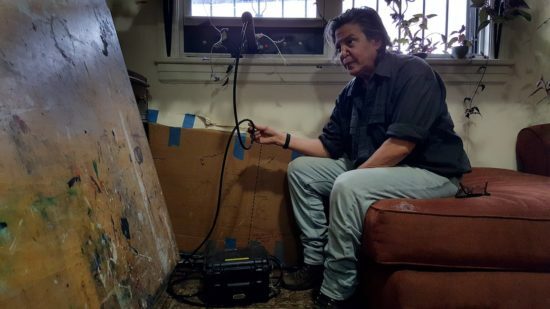 Mott Haven resident Giovanna Schluter says she never sets foot past the forbidding tunnel that leads to the river. But last Saturday there were signs of life in this no-man’s land, when about 100 people came to the Lincoln Avenue waterfront to enjoy the open space and cool breezes at the 2nd annual Mott Haven-Port Morris Waterfront Celebration, part of the citywide Metropolitan Waterfront Alliance’s City of Water Day. The annual event was designed to encourage communities to revive deteriorating waterfront areas, and to advocate for pubic access to them. A barbecue featuring Mott Haven grill master Jake highlighted the afternoon, along with canoeing, fishing, and live music by Plenartorium, Upbeat: The South Bronx’s Children’s Orchestra, and the Bandistan Ensemble, who played music from Kyrgyzstan and Uzbekistan. 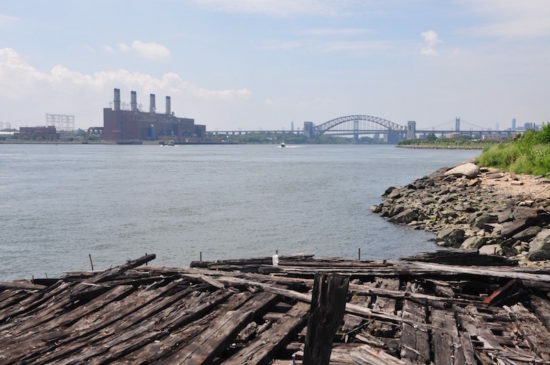 Community activists from South Bronx Unite, Friends of Brook Park, the Waterfront Alliance, and the Bronx Council for Environmental Quality urged residents to unite and fight for public access to their waterfront, which has been off limits to the public for years. 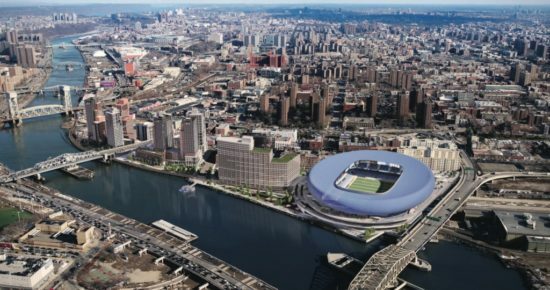 The Lincoln Avenue area is one of eight undeveloped Harlem River waterfront parcels in the South Bronx that could be facing major changes. South Bronx Unite spokesman Mychal Johnson advised residents to demand a say in any new riverfront development, similarly, he said, to the way things are done in wealthier New York City neighborhoods. Evelyn Alvarez, who moved to Mott Haven four years ago because she could no longer afford her rent in Harlem, attended the celebration with her boyfriend and her dog, to support the cause. A team of architects representing the PennDesign group from unveiled renderings of proposed ways the waterfront could be transformed so it can benefit the neighborhood, based on the state’s Mott Haven-Port Morris Waterfront Plan. Ellen Neises, a professor at the University of Pennsylvania’s Graduate School of Design, presented a range of options that included storm water protection, openings for tidal ecology along the greenways, lighting design for outdoor events and outdoor art galleries. That group previously spearheaded efforts to secure funding to protect Hunts Point from flooding, as part of the federal Rebuild by Design study. “We met with the people in the community and they talked us through their aspirations, and we figured out how to make them work ecologically, in terms of flood protection,” said Neises. Residents like Donny Johnson, a personal trainer, said he was enthusiastic about the new ideas. Johnson, who learned to dance to hip-hop while growing up in the neighborhood, said dedicating an outdoor area to physical activities would benefit residents. 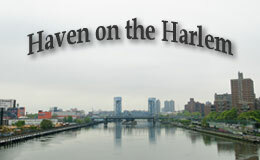 The Harlem River waterfront drew attention last week when The New York City Economic Development Corporation and Department of Housing and Preservation issued a press release asking developers to submit proposals for mixed-income housing and community and commercial space along a riverfront parcel just west of Port Morris. It states that “The site is currently vacant and presents a unique opportunity to create an iconic gateway to the Southwest Bronx, connect residents to the waterfront, and support growth along the Lower Concourse Neighborhood.” That parcel consists of roughly 158,000 square feet near 149th street and the Grand Concourse. Raymond Figueroa, program director for Friends of Brooks Park said residents should be on its toes and not allow the city to make decisions about any of the vacant waterfront parcels without the consent of communities. Others were hopeful that the city will work with elected officials and the community to shape waterfront projects. “We need affordable housing and access to green space, but we need to be deliberate in how we plan projects to make sure we are lifting up the community and not adding strain or division,” Johnson said in a statement.